Update: Despite recent radio silence, 2018 has some exciting developments in store. Stay tuned! I am playing around with the BMW PNPC program and all I can say is wow... I used to spend hours searching for parts and the best price and you have just probably saved the BMW from getting a new owner. Thank you so much. This is the best tool out there for finding prices. I use this application for finding each and every part whenever working on my car and I cannot even begin to tell you how much I've saved. PNPC is awesome, before I would do the ol’ copy and paste every part number into a generic spreadsheet and then I would have to go to the 3 or 4 sites that I commonly go to, to check prices. PNPC saves me so much time now and I can see more vendors, too. This is a very nice tool. I especially like the OE Price finder. . . . I wasn't aware that there could be so much variance on dealer price on their direct parts sales. OMG! This is amazing. I wish I knew about this before I refreshed my suspension on my E39 and E53. I spent hours, hours! Searching. This is the best thing I never knew I needed. I cannot wait until it is ready for the VW/Audi world too. We truly appreciate what you have done! I tell everyone I know with a BMW to use www.bmwpnpc.com. I wish I would have known about it years ago, could have saved me a lot of money. Very sweet program, definitely useful to the BMW community! Thanks for your hard work . . . . This is one of the most useful downloads I have ever seen for a BMW. Thanks! By god, this is quite amazing. I wish I had this a little while ago when I was jumping from site to site comparing prices. Great work! This is honestly what I've been waiting for! No more going through sites over sites looking for the best deal out there. Great program you created, bud! Thanks for putting this together! It basically takes what I'd do on my own anyway and makes it easier/faster! Click to stay up-to-date on forum discussions and new releases! Runs on 32-bit and 64-bit machines and supports a number of web browsers including Firefox, Chrome, Internet Explorer, and Opera, as well as other Mozilla variants including Cyberfox, Waterfox, and Pale Moon. 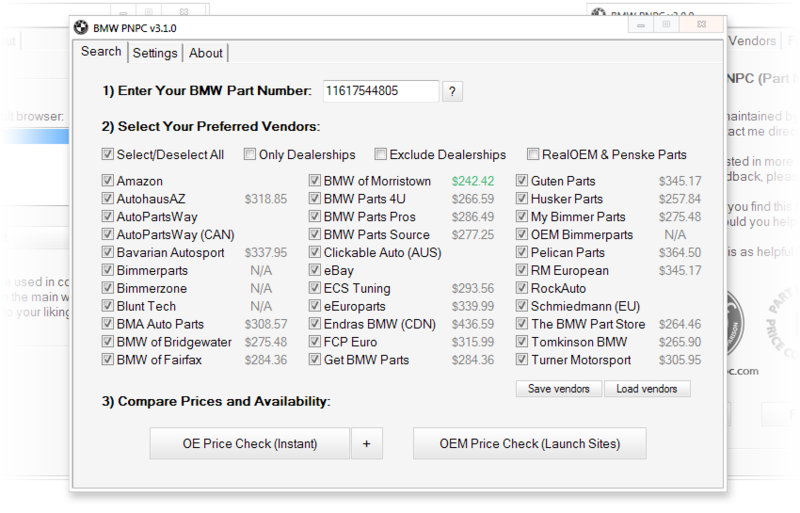 Return sites in individual browser tabs, display prices instantly from over 25 sites, export prices for easy spreadsheet creation in Excel, compare any part number from any program, save custom settings, and much more. Click here for alternate download methods.